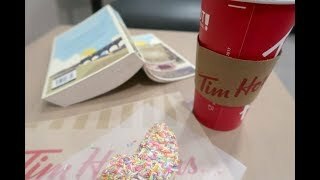 AD – This was a sponsored press trip. 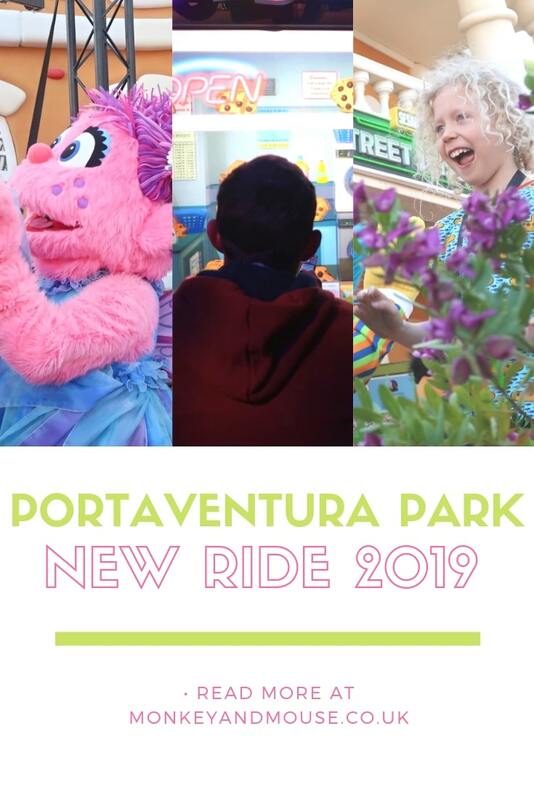 We were thrilled to be invited to PortAventura World for the opening of their new ride for 2019. 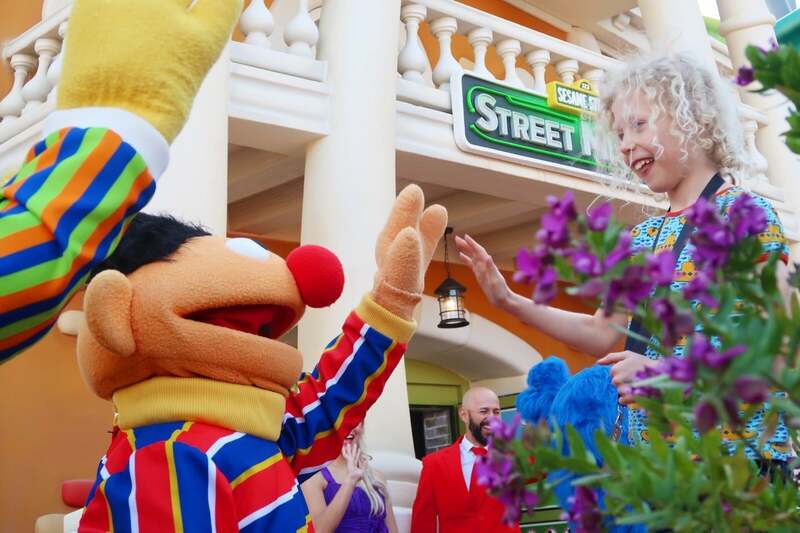 The new attraction is Europe’s first dark Sesame Street ride, which all the family can try. 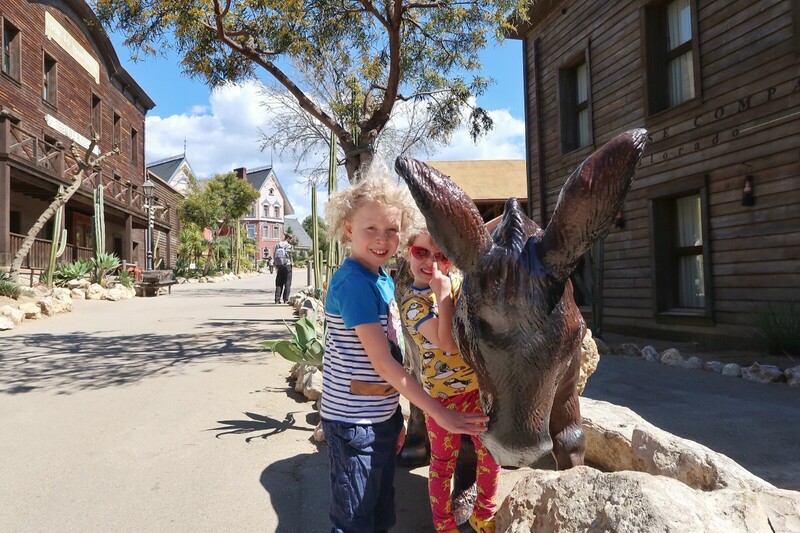 On the opening day we headed over to SesamoAventura Land, which is the colourful children’s area of PortAventura Park, with many rides for little ones to test out. Most of the opening ceremony was in Spanish, which we could understand a little, but that didn’t really matter. 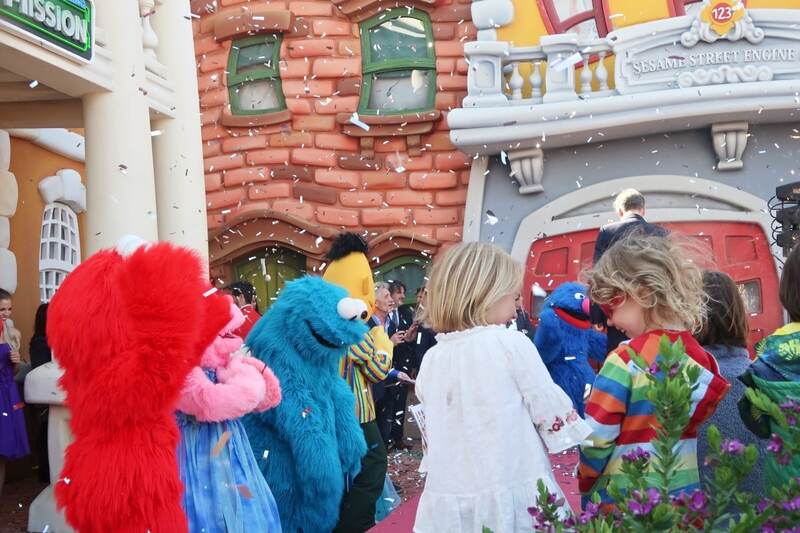 We could easily tell what was going on with the music, cheers and giant Sesame Street characters dancing around. 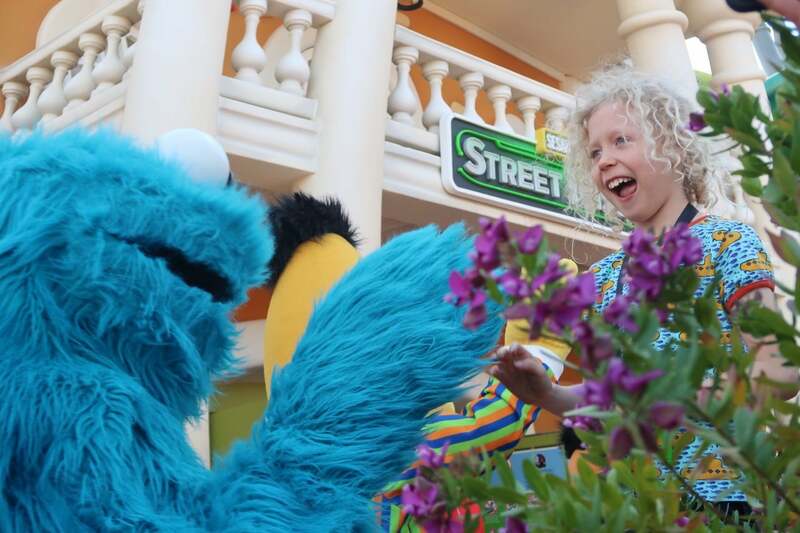 My eldest was ecstatic to high five all the characters as they walked past toward the stage. 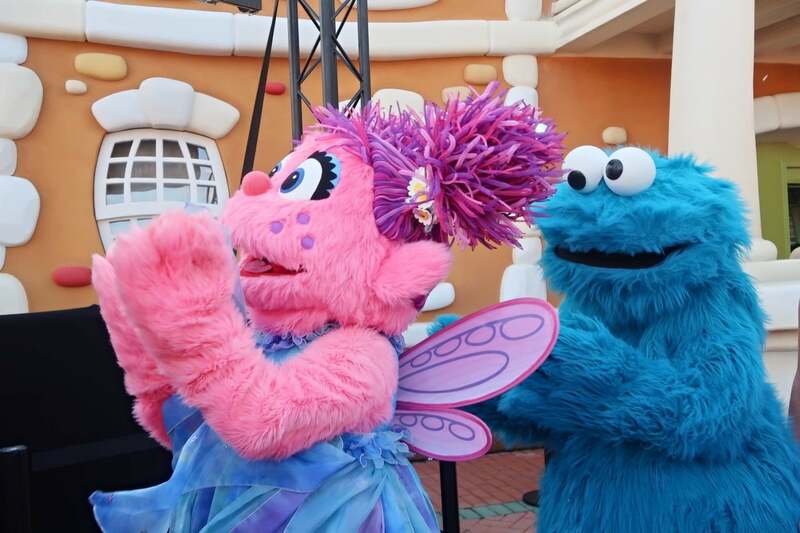 Cookie Monster and his friends had a little dance to music as the opening ceremony was finishing and the ribbon cut. The children in the audience were all bobbing along and enjoying the music when the confetti canons went off and thousands of sparkling silver pieces of plastic fell down. Not exactly eco-friendly, but hopefully they were recycled once the confetti was all gathered up. Littlest made a new friend and they had a great time watching the opening ceremony and were very excited to get to be one of the first people on the new ride. We had to queue for a little bit, but this wasn’t anything compared to later on in the day when everyone else waited to get on the new ride! There is also some light entertainment from Detective Grover as we waited to get on the ride. Someone had stolen the giant cookie and it was up to us to help Detective Grover find out who was the culprit. 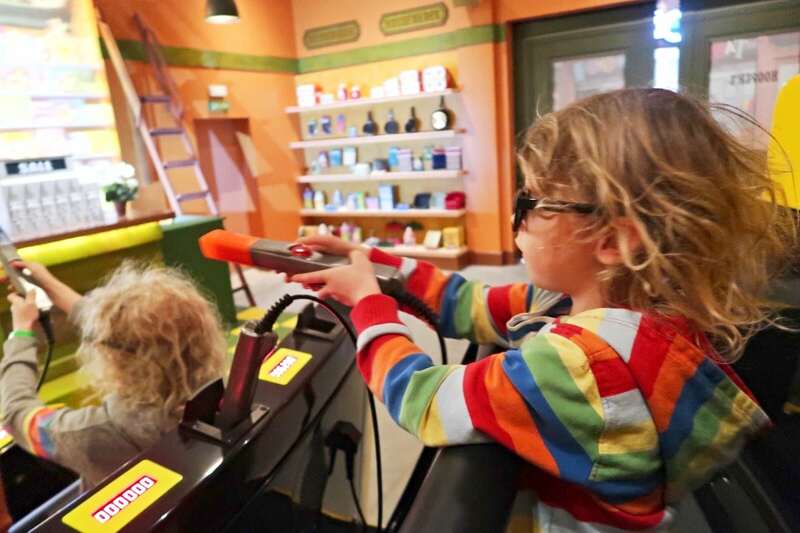 Not too long later we were in our yellow taxi with 3D glasses on, ready to find the cookie thief! There were 5 seats in the taxi and each person gets a wand to shoot at cookies on the various screens. 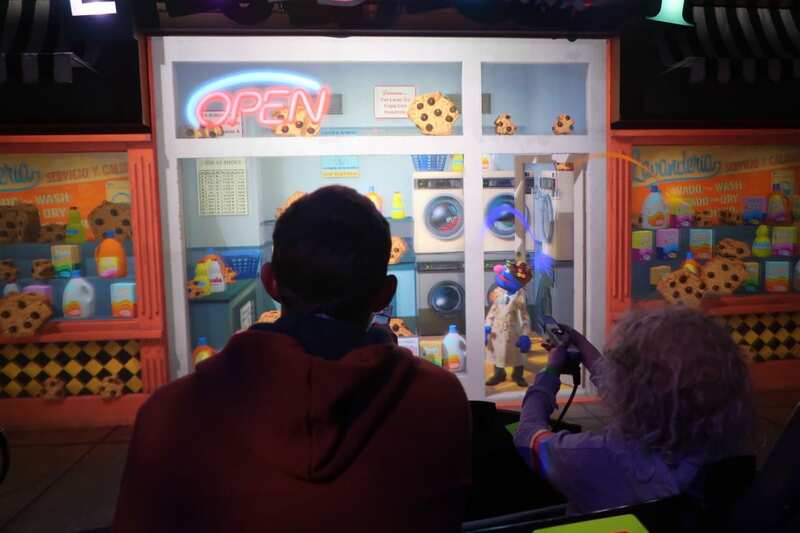 You point at the screen and press the button on the wand to make your coloured fire appear on the screen, blasting cookies and scoring points. Each person has a score board in front of them so you can compare at the end of the ride to find out who has the most points. I’m rather competitive and managed to get the highest score whilst taking photos with my right hand! The kids favourite part of the ride was a section where the vehicle was in one place, but the screen and movements of the taxi made it feel like we were flying through various different scenes! It was great fun and everyone enjoyed the whole ride. I love that it’s something fun and exciting for older children, but even toddlers are able to go on the ride! Aside SesamoAventura land, there are 5 other themed areas in the park; China, Polynesia, Mediterrania, Wild West and Mexico. For our children the main areas with rides available for their heights were the Wild West and SesamoAventura. Although every area had at least 1 ride for younger children and another that my 7 year old could easily go on. Our 5 year old is a little bit small for his age and is a few centimetres away from 110cm, so he couldn’t go on as many rides as his brother. But we still found enough for him to do as well! Somewhere in that huge splash above is our 7 year old and myself. 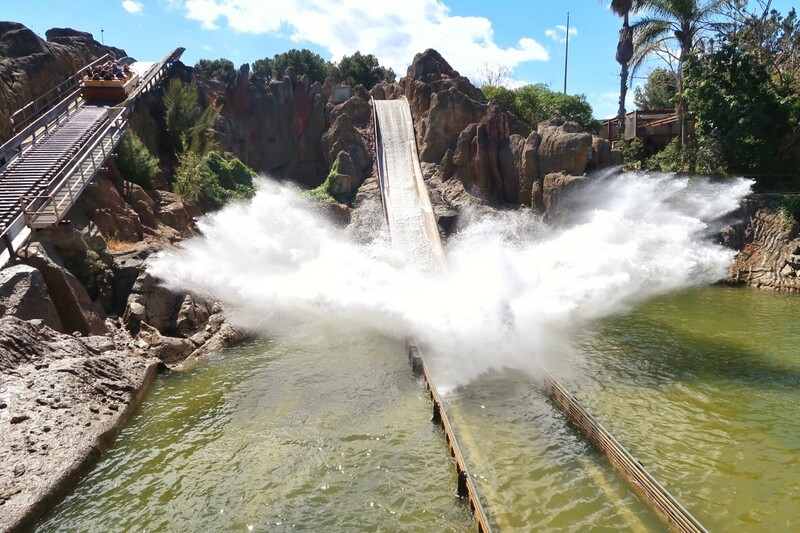 We chose to go on Tutuki Splash in Polynesia, a log flume type ride where you will get absolutely soaked! Polynesia also had a much smaller boat ride for little ones, Canoes. There is a little river and a small hill with a splash, but enough to keep the smaller or less adventurous kids happy! Our 7 year old had a go, but it was the 5 year old who wanted to go on the Canoes over and over! 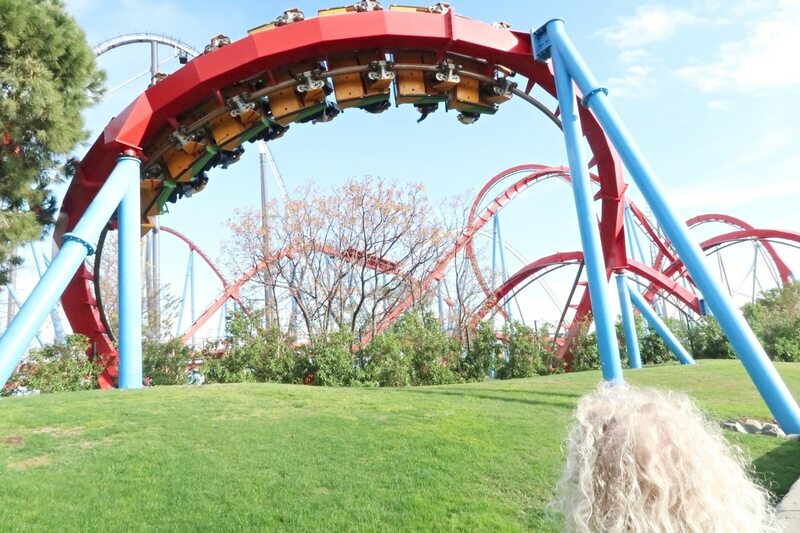 I personally enjoyed China where there are two amazing rollercoasters. Dragon Khan and Shambhala both have their merits, but I think I particularly loved Dragon Khan (the red track) as there were 8 loops to go round at a speed of 110 km/hour! However, Shambhala, the white track, had the steepest drop in the park, going up to a height of 76m. It definitely had my heart racing as I was zooming across the length of the track! I was very glad we had the fast passes from our hotel, without them I probably wouldn’t have had a chance to wait for my turn. But with the fast pass I could walk straight to the beginning of the queue and be on the ride and back with the kids and my husband within 10 minutes. They seemed quite excited knowing that I was on one of the rollercoasters they were watching! Our 7 year old gave me a huge hug each time I came off a rollercoaster, I think he was perhaps a little concerned over my safety on the rides even though I assured him it was absolutely fine. China also has Angkor which is a good ride if you like soaking others with water guns. 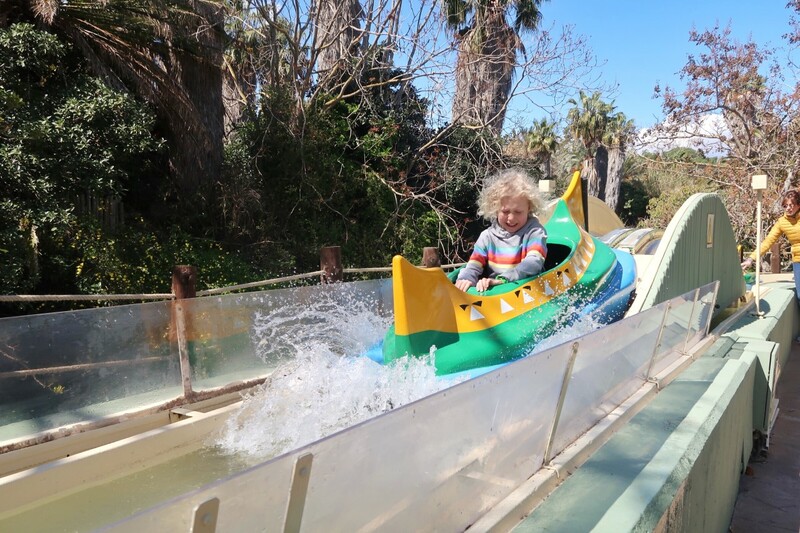 Younger children can go on this ride too, but you will get wet! Mexico held our eldest’s favourite ride, which he went on at least 4 or 5 times! El Diablo, the mine train is a good started rollercoaster for children and adults alike. He loved it, although I was surprised that I couldn’t convince him to go on a similar ride in the Wild West that was a little faster. Littlest enjoyed riding the more sedate Los Portillo’s (horses) and armadillos in the Mexico area, whilst his brother rode El Diablo. As he was under 110cm we needed to go on with him, it will be a lot easier when he gains a few more centimetres in height! The Wild West is where our hotel was located, through a ticket barrier, but it also held many rides that the children could ride. There were Buffalo shaped dodgems, Grand Canyon Rapids, Silver River Log Flume, Stampida rollercoaster, carousel, Tomahawk and the station for the train to SesamoAventura land. There are plenty of shows throughout the park, but we didn’t catch any. If we had stayed another full day in the park we would have been able to fit in some shows along with the rides, but it’s impossible to do it all in one day! On the second day at the park we visited Ferrari Land, which is all about the various Ferrari cars throughout the years. Our eldest was very excited as this was something he was looking forward to. 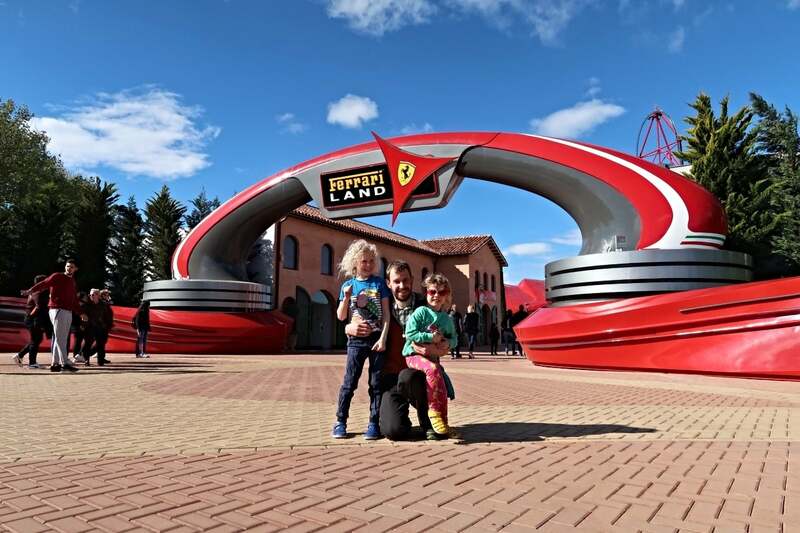 Ferrari Land is a lot smaller than the main PortAventura park, but there is plenty to do for all ages. The main rollercoaster, Red Force, has a huge drop and really does roar like a racing car! I didn’t manage to get a chance on that particular rollercoaster, but it looked awesome! We tried out two rides inside the dome, the first was Flying Dreams, where we flew over different Ferrari’s. The realistic wet mist as we flew through clouds made it feel quite real as we followed the cars. Racing Legends was also an indoor experience where we were driving cars along different tracks in a 3D experience. 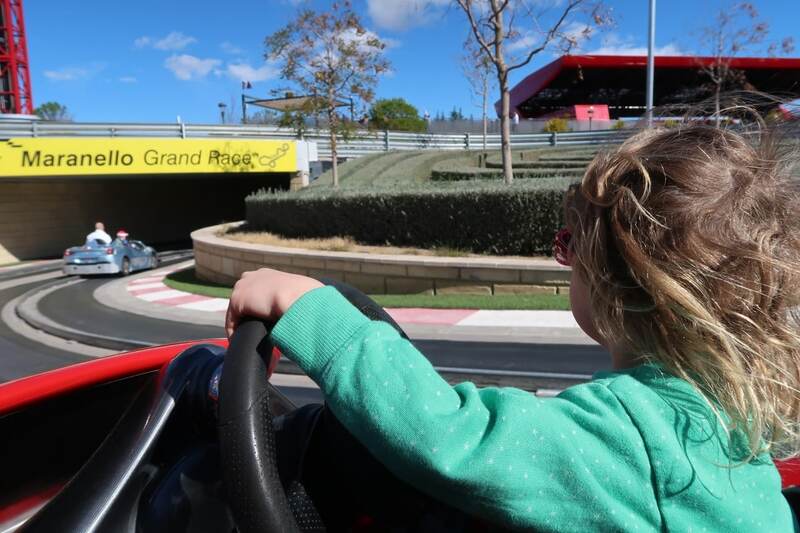 Littlest particularly enjoyed the Maranello Grand Race, driving Ferrari’s around a track on metal guide bars. There is a children’s area which has plenty of smaller rides, including a small Ferrari coaster, kiddie airplanes and cars plus a smaller version of the adult Thrill Towers. 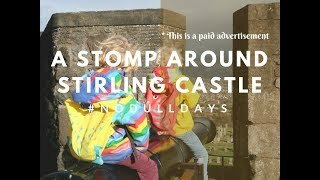 The kids had an amazing time, although I think they would have just as much fun staying at the main park for a second day! 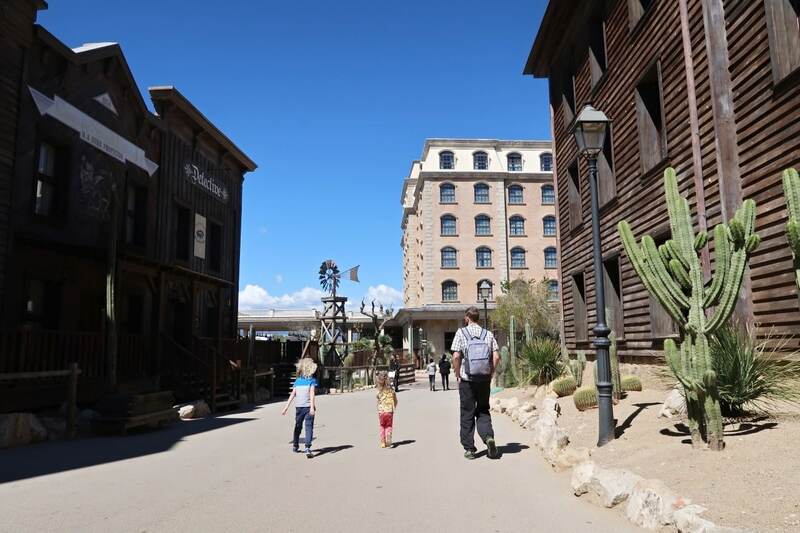 There are several hotels just off the main Wild West area of PortAventura Park, which includes an extension of the wild west theme. 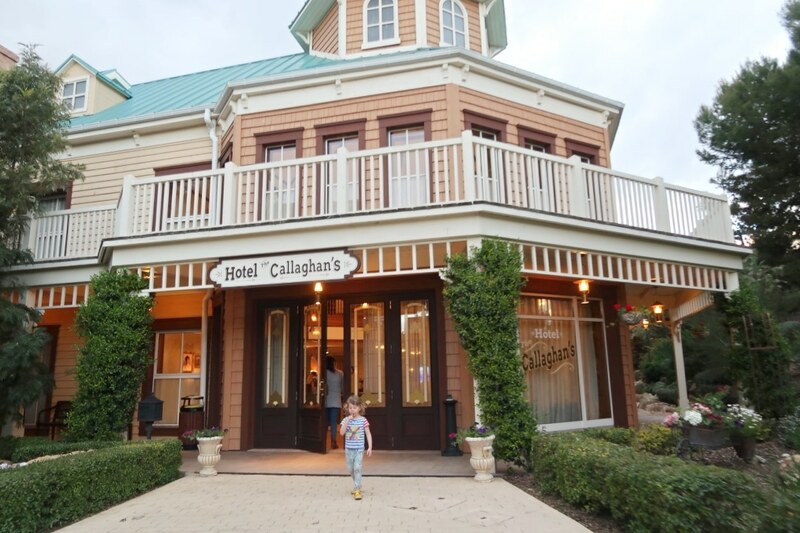 Our hotel ‘Hotel Callaghan’s’ was no different to the rest of the area and everything inside the building had a bit of cowboy feel. There are plenty of pictures of cowboy and girls, wearing the traditional western garb, plus plenty of fake cow hide items and even cowboy boots and chaps in the restaurant. 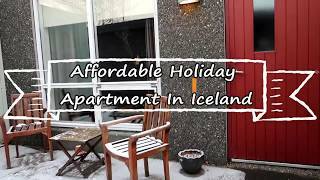 The whole hotel was well thought out to fit in with the theme and was beautifully clean and very comfortable. Outside there are plenty of buildings masquerading as banks, saloons and stores. 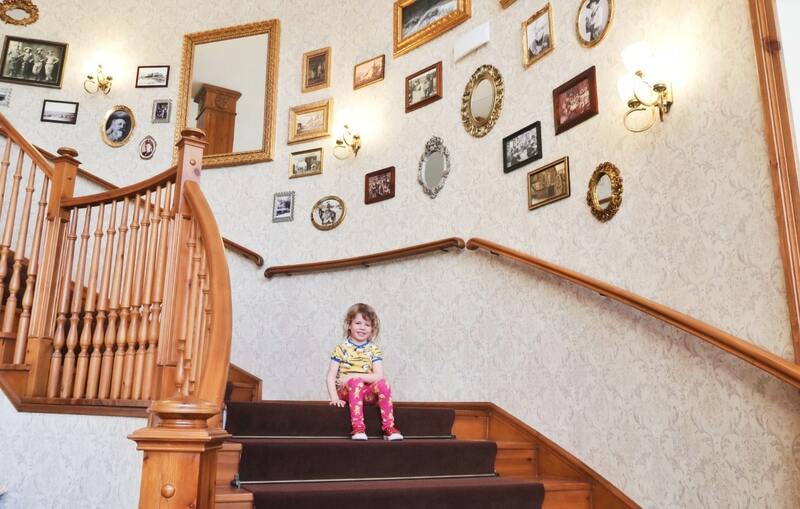 Some are hotels like ours, whilst others are actually storage buildings or similar. The cacti are definitely real though, I wouldn’t recommend touching them! 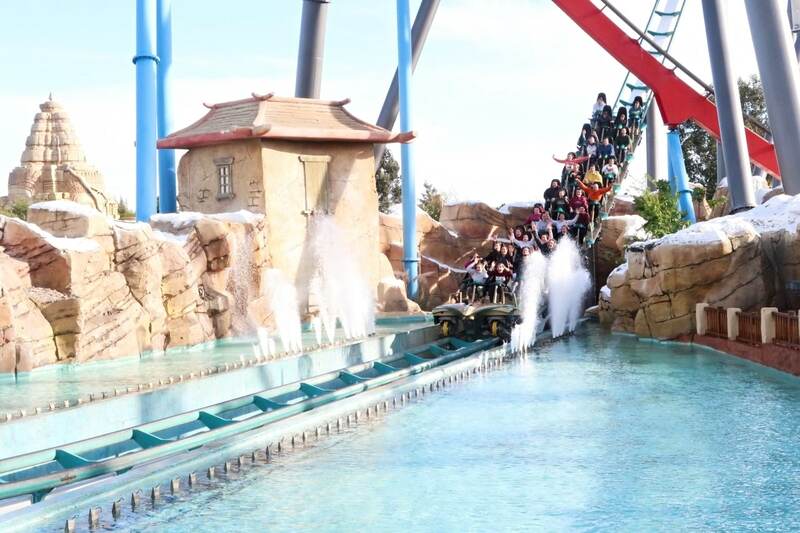 We had a fantastic time at PortAventura Park and would certainly head back again one day. 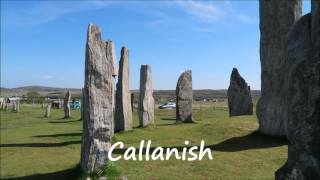 It’s great to know that there is a lot to do for both children and adults.